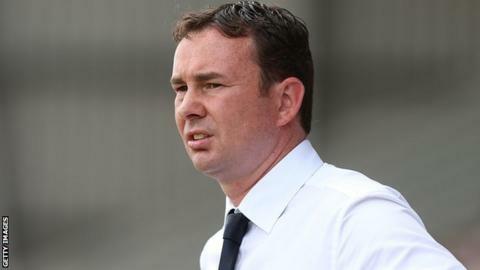 Plymouth Argyle manager Derek Adams says he finds the suspension system in England "frustrating". Football League players who get five bookings in all competitions before December are given a one-match ban. In Scotland, where Adams has spent most of his career, yellow cards picked up in cup games are separated from those received in the league. "They're all amalgamated together. That's frustrating and not something that happens in Scotland," he said. "I think it's a bit strange because the further you progress in a cup, you pick up bookings and it counts in a league match." Defenders Carl McHugh and Gary Sawyer will miss Tuesday's Football League Trophy tie at home to rivals Exeter City because of the rule. Both have picked up four yellow cards from 11 league games for the League Two leaders, with their other bookings coming in cup competitions. "It's frustrating from the point of view that they miss the cup match," Adams told BBC Radio Devon. "Cup bookings count and the league bookings count - I find that strange in the way it's set up. "I'm just concerned that we've picked up bookings in games. Some of them are bookings and some of them are not."